Migos is an American hip hop band, comprising of three artists known as Offset, Takeoff and Quavo. This trio, Offset (born as Kiari Kendrell Cephus), Takeoff (born as Kirshnik Khari Ball and Quavo (born as Quavious Keyate Marshall) hail from Gwinnett County, Georgia and they came together in 2009 to form the Migos band. These three people are directly related to each other and they were also brought up together. Migos came up with their maiden full length project, a mixtape called Juug Season in 2011. In 2012, their second project called No Label was launched. The real breakthrough happened with their commercial debut single known as Versace in 2013 and this creation managed to find a place in the Billboard Hot 100 Chart. It was just a beginning for this trio and in the same year, they came up with another mixtape titled Y.R.N in which they included lead single Versace. Versace had won them the celebrity status by featuring in various hit charts. This hip hop band came up with many more singles like Bad and Boujee, Look at my Dab and Fight Night during the past few years. Their first debut album titled Yung Rich Nation was released in 2015 and the next album Culture (2017) was on top of the Billboard 200 chart. Migos have collaborations with producers like Zaytoven, Murda Beatz and DJ Durel and the former manager of the well known rappers Young Jeezy and Gucci Mane called Coach K manages the activities of this hip hop band. 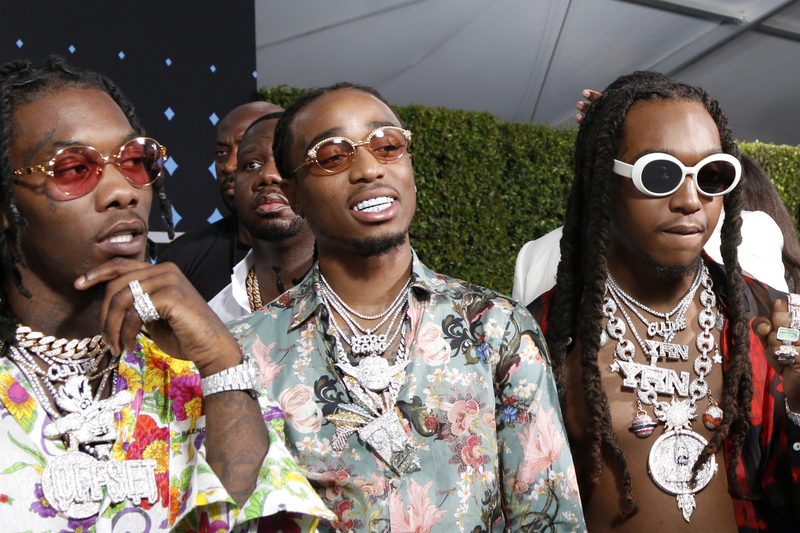 In 2017 BET Awards, Migos won the awards for best group and best collaboration and, they have also managed to achieve several BET Awards and Billboard Music Awards nominations for First Night, No Label 11 and Bad and Boujee. This trio also featured in a short film titled Bando in 2014. The music critics have never doubted the creativity of these artists and they have already received a lot of critical acclaims for their musical contributions. Find out Migos lyrics you love and enjoy! ● lazy song nutrition jingle b..
● proclaim lord we praise you ..
● something we all adore, solo..
● tears will come late so late..
● i been waiting for so long n..
● vector ft olamide mind your ..
● alpha and omega.lyric by joe..
● india 20 album song 1 my ind..
● when your knees are shaking ..
● hugot hugot oc dawgs hd l..
● the champion by nathanial ba..
● the champion byamadin ft nat..
● music to baby ive been drown..
● say yeah yeah yeah do the sh..
● amadin ft nathanial bassey t..
● your a sad song waiting to h..
● selah bless the broken road ..
● tell you one more time. what..
● 10 cute ways to tell him i m..
● take me down to the river si..
● im hidden in the past lookin..
● skusta clee all songs kalamo..
● rosalee song with...noone kn..
● yeee ooo o o o aaa aaa u u u..
● 2 4 time signature:filipino ..
● oooh oooh ohhh 2010 male sin..
● say yes i do by allaine ft w..
● you are god alone by sinach ..
● cabe mai na siga vou vei au ..